Yolen, Jane, The Devil’s Arithmetic, Scholastic, Inc: New York, 1988. Author Jane Yolen will always hold a special place in my heart. She was my writing tutor in the sixth grade. Yup, it’s true. I have no idea how my school district finagled that or if this was a regular part of her community service or what, but once a week she came out and worked with me one on one. Apparently this is what happens when you’re the one kid in class whose stories are always over the page limit and not under it; people start to wonder if you might have some talent. 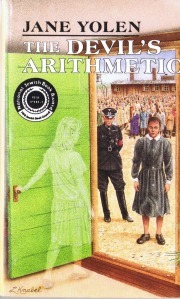 Anyway, I can’t say that I remember much of what she taught me, or even much about the many books of hers that I’d read before I met her, but recently I ran across this young adult novel of hers called The Devil’s Arithmetic. I had never heard of it, but believe me, once you’ve read it, you’ll never forget it. The premise concerns an adolescent American Jewish girl who, in the midst of a Passover celebration a generation after World War II, mysteriously and magically trades places with a rural European Jew caught up in the midst of the Holocaust. It then traces – in surprising detail for a novel aimed at children – her experience of concentration camp life, with particular focus on the individuals surrounding her, and their methods of coping with their chilling confinement. Indeed, the book’s greatest strength is perhaps its ability to “rehumanize” what are, to most of us, faceless masses of concentration camp victims, by delving into their various personalities. And they are human, very poignantly so. While there is a fair share of heroism among the main characters, there is hopelessness and helplessness as well; selfish and altruistic behavior on both sides. The sufferers are not perfectly good, just as their captors are not perfectly evil. In addition, by literally walking the reader through the trials of entering and then residing in a concentration camp, the book introduces young readers to the Holocaust in a very accessible manner; by forcing them to live it day by day along with the main character. In some ways it reminded me of John Hersey’s The Wall, in which you follow the daily routines of a small group of Jews clinging to life in the Warsaw ghetto during WWII. Sometimes you forget that Jews and other victims of the Nazis were not merely killed; they lived entire lives between their moments of capture and execution or eventual release, and The Devil’s Arithmetic makes those lives real. My one complaint about the book is that I had difficulty accepting the premise itself. I can certainly see why the author presented events the way she did – there are solid reasons for it in the story – but when confronted with evidence of the “switch,” I sometimes found myself unable to suspend my disbelief. But this is a very small flaw in an otherwise wonderful work that has the power to truly bring home the experience of the Holocaust to all readers, young and old alike. This entry was posted in Not-Always-So-Popular Culture on September 7, 2013 by lorilschafer.